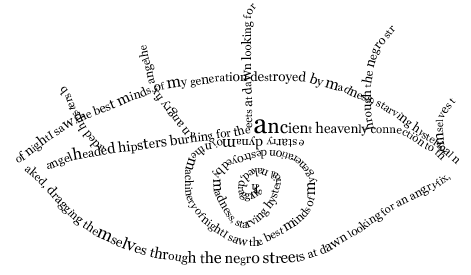 Explore your creativity by drawing word mosaics with your poetry. Enter your poem or other text in the "Text" field. 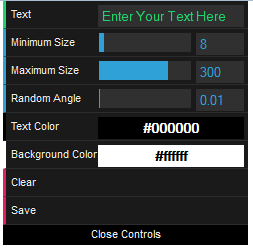 Optional: Choose minimum size, maximum size, random angle, text color, and/or background color. Click anywhere on the page, hold down the mouse and draw a picture. Click "Clear" to start over or "Save" to save your drawing as an image.